"Do you need some kitty kisses? I've got an endless supply. And with a name like mine, well, I promise I'm as sweet as my namesake! Don't I look as if I just stepped out of Whoville?" "I love climbing on laps and being petted, too. You'll love how soft and silky my fur is. I'm friendly, curious, and playful, and I make friends in an instant. The only thing I ask is that you don't hug me or pick me up much-- I'm a little claustrophobic and tend to panic if I get squeezed. I need an adult-only home where I can love my humans on my terms. Thanks for understanding. If you're looking for a gorgeous girl to be your companion, I hope you'll come see me soon! Miss Who is sweet enough to melt the heart of any Grinch - and she's waiting for her forever family at Allie's Alma Mater, Wayside Waifs. Aw, isnt she adorable! I hope she finds her people soon! She is very sweet looking! I love the white tip on her tail! She's such a pretty girl, and we (Nicki, Derry and me!) all hope she'll find a wonderful forever home very soon. We too hope Cindy finds her special people soon. Good luck to her. Have a wonderful Wednesday. Look how sweet you are... and what a darling name. We hope those grownups who deserve a wonderufl girl like you find you soon. 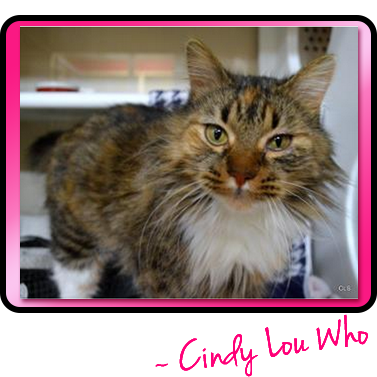 Cindy Lou Who was adopted just a few hours ago!!! I just loved her to pieces! how has she not found a home yet?? CINDY LOU HAS LEFT THE BUILDING! Awww you precious little girl. We hope someone takes you home with them really soon.